As an archivist working with artist archives, one of my greatest sensitivities is ensuring that the logic of how an artist maintained his/her studio is recognized and preserved. Best practices must include maintaining that logic when preparing the materials for transfer to an archival repository, be it a museum, academic institution, or foundation study center. Preserving original order is a basic tenet in archival practice, but not always recognized when an estate is handling an artist’s studio after the artist passes away. Preserving the structure of how an artist used and accessed their resources provides valuable clues to the workflow of the maker. One such artist whose creative process remains elusive is Henry Darger (1892-1973). Darger, a self-taught artist, worked in a one room apartment/studio. 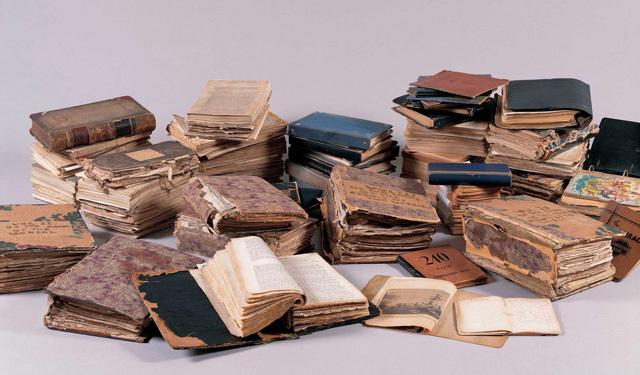 On his deathbed, Darger reportedly told his landlord to dispose of all his work. Thankfully, for those of us who admire and value his art, the work survived his death. 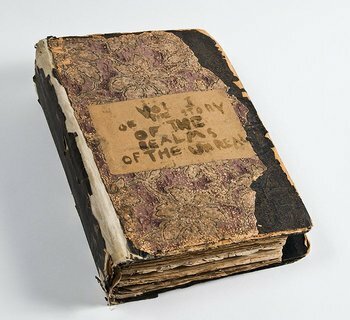 Darger, who worked as a janitor, spent his time illustrating and writing a 15,000 page tome – for no one but himself. The quantity and quality of his work is astounding. When faced with the life’s work of someone who lived reclusively, how exactly does the archivist and/or curator arrange, describe and catalogue this work in a way that researchers and museumgoers can grasp? And, what are the best approaches to working with this material in digital form to allow for others to study that artist’s process ? I had the pleasure of spending an inspiring day at the American Folk Art Museum (AFAM) this week, surrounded by the work of Henry Darger, as well as a team of historians, curators, fellow archivists and museum administrators dedicated to the preservation of Darger’s work. The panel discussion was hosted by fellow archivist, Mimi Lester and AFAM curator Valerie Rousseau, who led us through a lively brainstorming session focused on AFAM’s current NEH grant, supporting the digitization of Darger’s archival material. I was involved with the processing of Darger’s extraordinary collection back in 2008 and, as the panel discussion continued, I was reminded of so many of my “notes-to-self” scribbled in my mind during its processing. I couldn’t help but recall my on-going work with self-taught visual and performing artist Christopher Knowles. Like, Darger, Knowles often works from photographic prints and news clippings. I’ve always been intrigued and frankly mystified by the ways that Chris keeps his visual data in check when rendering paintings and drawings. I have had the honor of quietly watching Chris from a distance as he works. 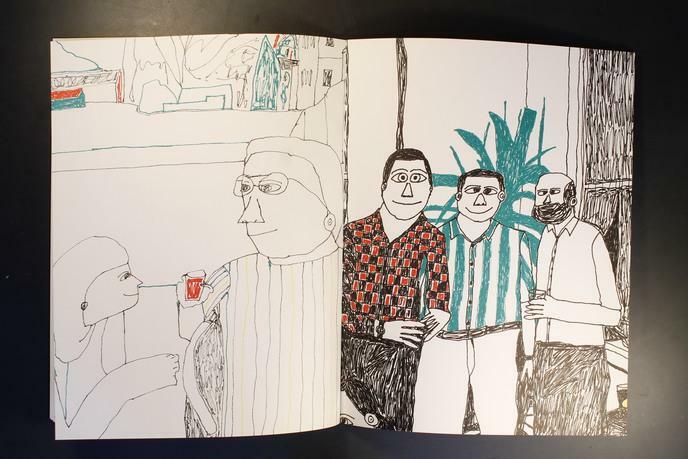 It is not unusual for him to work from one lower corner of an image up to the opposing diagonal corner — downloading visual data, so it appears, as the detailed memory of an image is conjured by his hand onto the page or canvas. Unfortunately with Darger, his workflow is lost to time, particularly considering what sparse photo documentation there is of Darger the man, much less, Darger in the studio. Did Darger “unfurl” his imagery in one fell swoop, the way Christopher does when painting or drawing? I wonder if Darger, too, worked from within the autistic spectrum, and if his highly stylized aesthetic holds possible clues to the extraordinary functioning of his brain. Between the artist’s workflow and the archivist’s process much can be lost. Ironically, for an archivist, it is the grandest space for intrigue and study when working within an archival collection. Fortunately, even the tiniest scraps of Darger’s papers, will soon whisper meaning to us all in digital form thanks to current efforts at the American Folk Art Museum.